Does lonelyartist83 belong in this group? clay sculpting I like clay sculpting. i have been using clay since I was a kid using Play-Doh. Does mauricio86 belong in this group? 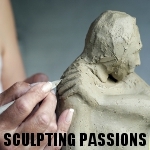 Love sculpting I'm a very amateur sculptor and want to learn more. Especially love sculpting in clay but would like to try other mediums. Does curiousexpl69 belong in this group?